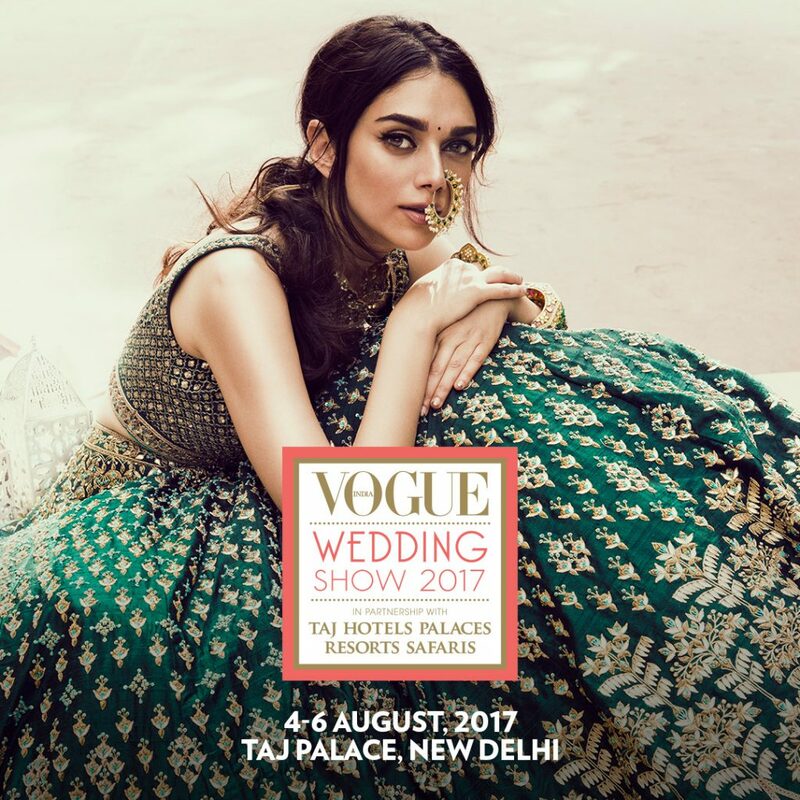 The Vogue Wedding Show, India’s luxury bridal exhibition, is all set to return for its milestone fifth year in August with actress Aditi Rao Hydari as the face of the flagship property. Held in partnership with Taj Hotels Palaces Resorts Safaris, the fifth edition of the specially curated, luxury event will feature some of the most premium and personalized category leaders and services from the Indian wedding circuit. Poised to be grander and bigger this season, the Vogue Wedding Show 2017, to be held from August 4-6 2017 at the Taj Palace, New Delhi, will offer guests the opportunity to make selections for their dream wedding. To get invited to this ‘by invitation only’ luxury exhibition, one must register on www.vogueweddingshow.in or call +91 7045400070 or +91 7045400071. Apart from being the only place where attendees can enjoy personal meetings with India’s topmost bridal couture designers, the Vogue Wedding Show 2017 also offers guests the exclusive opportunity to meet with wedding specialists, India’s finest jewellers, trousseau gifting brands, décor experts, and wedding planners. The attendees of the Vogue Wedding Show 2017 get the chance to attend exclusive masterclasses and interact with an enviable line-up of industry experts. For the Vogue Wedding Show 2017, Vogue India has handpicked some of the best jewellers across India to showcase some spectacular wedding jewellery, with leading names like Amrapali, Anjali Bhimrajka Fine Jewels, Birdhichand Ghanshyamdas, Hazoorilal by Sandeep Narang, Hazoorilal Legacy – South Extension, House Of Surana By Pankaj Surana, Khanna Jewellers, Moksh – Fine Unseen Jewels, Raj Mahtani Couture Jewels, Rakyan’s Fine Jewellery, Rare Heritage, Renu Oberoi Luxury Jewellery, Savaab, Sunita Shekhawat Jaipur, amongst many others. While Amrapali is moving away from traditional chokers, Anjali Bhimrajka Fine jewels proclaims diamond collars, palm cuffs and ear pendants are the statement trends for this wedding season. Find out what’s trending this season and everything you can expect at the Vogue Wedding Show right here. Also, a dedicated space will house a ‘Sari Pavilion’ comprising sarees from different regions of the country such as Latha Puttana, Naina Jain, Palam Silks, Pattanga and Ratanshi Kheraj Sarees, among others. For gifting and trousseau ideas, and for wedding related facilities that are luxurious and original, brands like Ahujasons, Anahata Creations, Disneyland Paris, Halcyon Days, Magnificence, Nordic Kandie, Nupurh J Silverware by Nupurh and Nidhi Jain, Ravish Kapoor Innovative Invitations, Shingora, The Good Life Company, Wednikshka, and many more can be found at the show.